Pundit gives "his" take on Jose Mourinho = Most obvious statement EVER! 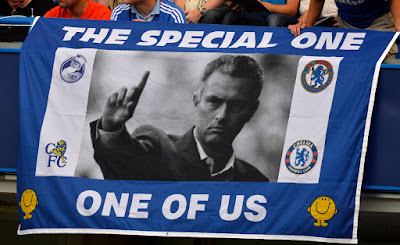 According to an ex-Chelsea player, Jose Mourinho remains as Chelsea Manager purely because of the fans. It's the most obvious statement anyone could have said to be honest! OK, Tony Cascarino played for Chelsea back in the nineties but made JUST forty appearances in two seasons. Despite this, he constantly pops up on SkySports to give his opinions on the Blues as if he is an expert on the club and the fans and it's doing my head in! We've all sat there today with the focus on news bulletins around Cobham and Stamford Bridge as Roman Abramovich called this "reported" emergency meeting to discuss the managers immediate future. It was almost as if everyone on the planet expected Roman to wield the axe and for a statement to be released stating that press got their wish. It never happened, Jose Mourinho lives to fight another day or two at least. So why hasn't Roman decided to act and for the time being at least, stuck by the manager? For those of you that like to read blogs and opinions of real Chelsea fans such as myself, you would have seen my post and subsequent comments as I asked if there was any point of sacking the manager now? "We must be surprised that he's still in the job. We've seen the likes of Luis Scolari, Roberto Di Matteo, Andre Villas-Boas and Carlo Ancelotti all leave that club. Mourinho has been given the full backing of the board so far because he is so successful. He is known as the messiah of Chelsea Football Club - but he can still lose his job. How can this continue? To survive they have got to go on an unbelievable run and be in complete contrast from what we've seen so far. But on this season so far, there's no evidence they can do that. He's tried everything. Without six points from Watford and Sunderland I can't see him staying. The only people still behind him are the fans. They're still singing his name because they have such affection for him. But they're losing football match after football match. Against Leicester they were second best all over the field and that will be a massive concern to everyone at the football club. There's fine line as a manager about how far you take criticism of your team. Behind closed doors you can say a lot but when you go public and say it was a 'betrayal', there are a lot of players who won't like that. It will make the atmosphere toxic in that dressing room. They'll look at Jose and say 'what about you'?" As stated, the blatantly obvious and in addition to the other points he has raised, already covered on here! We all know that Roman was shaken by what happened with Rafa Benitez and the outcry from Blues Supporters to his appointment and Roman's decision. He will not want to make the same mistake again.